Scuba Dive bags stucked and Corroded zipper - how to get Unstuck. How many times has this happened to you before? Just before heading out for a dive trip, you packed all your BCD, Regulator, wetsuit and realized that your trusty mesh bag zipper has stuck and you cannot opened it? Zipper on your scuba diving regulator bags, diving mesh bags and wetsuits are the most abused scuba equipment. Learn how you can take care of it today and prevent stuck zippers. The greatest invention of all time, Zipper. Without this invention, many items in the market would be created. The zipper has been used a million times yet no one realizes the great importance of it. In fact, not many of us know who created this invention or the origins of its beginning. The zipper that we widely use now, was not popularized until 1913. An Engineer named Gideon Sundback perfected his previous design, “Separable Fastener”. This design was approved and used by the U.S military for their flying suits and money belts. The word “Zipper” was coined by the sound made by his invention. Since it is the greatest, why does it still get stuck! Even the greatest invention, there are always flaws. Well, the zipper is not just flaw. It is just how it works. Let me briefly tell you how a zipper works. Use apple cider vinegar. Drop a few droplets at the stuck portion. Hopefully, it will dissolve any elements that are jamming the zipper. Usually, it will work and you can pull the zipper. *Caution: do it in open air else it will stink up the whole room. Soak the zipper into warm water and it will dissolve any elements that are jamming the zipper. *Caution: do not use boiling water as you might scald your hands. This is the best method. What you need to do is actually brush the zipper and lubricate it before storing it. It will remove all the elements and coat the teeth with a lubricant to prevent any elements landing on it. The most effective is always to protect it before anything arises. This is how one should do to prolong their zipper. 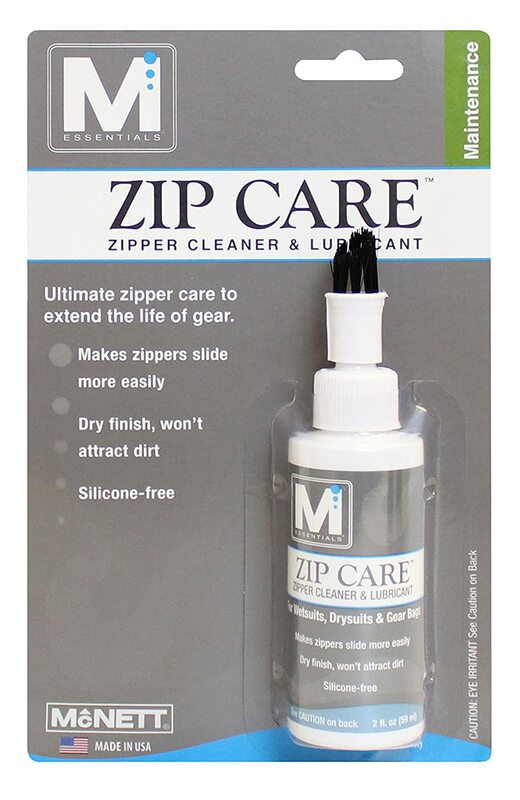 Easy application – brushing the zip up and down to remove any dirt, sands, and salts while applying lubricant. If not capped properly the top layer of the lubricant may dry out. When storing exposure suit, it prevents dirt and dust and hair to be trapped in the zipper as a layer of lubricant is formed on it. Brush had to be clean with lukewarm water to wash away sand, salt or dust that may be trapped. Carbon Brush is strong to brush out the dirt, dust, and sand without damaging the zipper. Watch this video tutorial to see how efficient it is.